To Cite: Byun S , Shin K E, Park J S, Lee H, Lee J W , et al. Immunoglobulin G4-Related Disease Unilaterally Involving the Pulmonary Interstitium and Pleura: A Case Report, Iran J Radiol. 2019 ; 16(1):e80281. doi: 10.5812/iranjradiol.80281. Immunoglobulin G4-related disease is a novel inflammatory entity involving multiple organs of the body. In the lungs, it is accompanied by infiltration of IgG4-positive lymphocytes and increased serum levels of IgG4. Previous studies have reported radiological findings of IgG4-related lung disease in the pulmonary parenchyma; however, there are few case reports of pleural involvement. Here, we report the case of a 66-year-old man with IgG4-related disease unilaterally involving the lung interstitium and pleura. Thoracic computed tomography images demonstrated pleural effusion and thickening resembling a primary or secondary pleural malignancy. The diagnosis of IgG4-related disease was confirmed by video-assisted-thoracoscopic biopsy. This rare disease should not be overlooked in patients with radiological findings that are suggestive of pleural malignancies. Immunoglobulin G4-related disease (IgG4-RD) is a rare and recently defined immune-mediated, systemic inflammatory disease characterized histopathologically by lymphoplasmacytic infiltration, storiform fibrosis, phlebitis, and abundant IgG4-positive plasma cells (1, 2). While it usually involves the pancreas and salivary glands, other organs may be affected as well including the lung, pachymeninges, orbit, liver, kidney, and prostate (3, 4). IgG4-RD of the lung is relatively rare and can be confined to the lung or develop in other organs simultaneously or metachronously. The clinical and imaging findings of IgG4-related lung disease (IgG4-RLD) are highly variable. While lung parenchymal involvement (mass like lesion or interstitial lung disease) and mediastinal lymphadenopathy are typical, airway or pleural involvement is rare (2). In fact, there are only a few case reports of IgG4-RLD involving the pleura, most often bilaterally, with or without disease in the lung parenchymal interstitium (5, 6). Here, we present the case of a patient with IgG4-RLD unilaterally involving the pleura and lung parenchyma interstitium and radiologically mimicking malignant pleural effusion with lymphangitic metastasis or mesothelioma. A 66-year-old man was diagnosed endoscopically with early gastric cancer and underwent further evaluation for surgical treatment. He had no history of hypertension, diabetes mellitus, or occupational or environmental exposure to dust or asbestos. He had never smoked. His physical examination prior to surgery did not reveal significant findings. He had no abnormal respiratory symptoms such as dyspnea, cough, sputum, or fever. The results of laboratory tests, including measurements of white blood cell (WBC) levels, erythrocyte sedimentation rate, C-reactive protein levels, and tumor markers (CEA, CA19-9, and CA-125), were all in the normal range. To evaluate distant metastasis of the gastric cancer, he underwent contrast-enhanced computed tomography (CT) of the chest and abdomen. The chest CT revealed a small amount of right pleural effusion as well as mildly enhanced thickening of both the pleura in the right lower hemithorax and the right bronchovascular bundles. Thoracentesis was performed to analyze the pleural fluid and rule out the possibility of malignancy. The pleural fluid was turbid, characterized by an exudate with a predominance of polymorphonuclear neutrophils (PMN), rather than lymphocytes, and eosinophils (WBC 1,296/mm3, PMN 20%, lymphocyte 5%, eosinophils 20%, other cells 55%). His adenosine deaminase level was within the normal limit (27 IU/L). Cytological examination of the pleural fluid was negative for malignant cells. Microbiologic tests, including for tuberculosis, were also negative. The patient was followed up closely, without further evaluation for the findings in the thorax, and underwent laparoscopic distal gastrectomy and gastro-jejunostomy for early gastric cancer. After 3 months, a follow-up chest radiograph showed an increased amount of right pleural effusion. A fluoroscopy-guided percutaneous thoracic drainage catheter was inserted into the right pleural space. Follow-up chest CT continued to show a right pleural effusion accompanied by enhanced thickening and nodules along the pleura in the right hemithorax. There were also multiple tiny fissural nodules in the right major fissures, but no change in the previous diffuse thickening of bronchovascular bundles in the right lung (Figure 1A - 1C). He refused surgical pleural biopsy and was discharged. Figure 1. A 66-year-old man with immunoglobulin G4-related disease (IgG4-RD) unilaterally involving the lung interstitium and pleura. Follow-up chest CT scan obtained with a contrast-enhanced mediastinal window setting of the axial (A) and high resolution computed tomography (HRCT) (B, C) images. A remnant right pleural effusion persists despite the insertion of a chest drainage catheter in the right hemithorax. Enhanced nodular thickening (arrow in A) along the right pleura is also present. Diffuse thickening of the bronchovascular bundles persists in the right lung (arrows in B), together with multiple tiny fissural nodules (arrowheads in C) in the right major fissure. [18F]-Fluorodeoxyglucose positron emission tomography-computed tomography fusion images. Multiple, heterogeneously increased (maximum standardized uptake value [SUV0 = 4.9]) foci are seen along the right pleura together with right pleural effusion (D). A follow-up chest CT scan performed 4 months after the first one showed increased multiple fissural nodules with bronchovascular bundle thickening in the right lung. The amount of pleural fluid in the right hemithorax had increased with diffuse pleural thickening and enhancement. [18F]-Fluorodeoxyglucose positron emission tomography-computed tomography (PET-CT) demonstrated heterogeneously increased metabolism (maximum standardized uptake value [SUV max] 4.9) along the pleura of the right hemithorax (Figure 1D). Abnormal uptake indicating additional organ involvement was not seen on PET-CT. Although previously performed pleural fluid analyses were negative for malignant cells, neither lymphangitic metastasis of the gastric cancer nor a primary pleural malignancy such as malignant pleural mesothelioma could be excluded based on CT findings of progressive pleural thickening and nodules with pleural effusion and abnormal FDG uptake on PET-CT. Finally, video-assisted thoracoscopic lung and pleural biopsy was performed to exclude the possibility of malignancy. The pathologic result showed dense infiltration of lymphoplasmacytic cells with a high (> 50%) IgG4/IgG ratio. The final diagnosis was IgG4-related lung disease (Figure 2). Figure 2. Microscopic findings of the wedge-resected pleura. Hematoxylin and eosin (H&E) staining reveals a pleura lesion. The pleura is diffusely thickened by dense inflammation and fibrosis. (H&E, 40×) (A). A plasma-cell-rich inflammatory infiltration is present in the pleura (H&E, 200×) (B). Immunohistochemical stains for Immunoglobulin G (IgG) (C, 200×) and Immunoglobulin G4 (IgG4) (D, 200 × 200) reveal a ratio of IgG4/IgG-positive plasma cells > 50% (C, D). After the diagnosis, the patient was prescribed oral prednisolone at an initial dose of 40 mg/day, tapered gradually to 2.5 mg/day. A follow-up chest CT showed gradual improvement of the right pleural effusion and improvement of the bronchovascular bundle thickening in the right lung. The patient continued to be asymptomatic. IgG4-RD is a novel multi-organ inflammatory disorder characterized by the subacute development of a mass-like swelling or enlargement of an organ, increased serum levels of IgG4, infiltration of IgG4-positive lymphocytes, and storiform fibrosis of tissue (3, 7, 8). It usually occurs in middle-aged Asian males and responds well to corticosteroid treatment (9). The pathogenesis of IgG4-RD is poorly understood, as is the physiological role of the IgG4 antibody, including whether it has a stimulatory or inhibitory role in the inflammation and fibrosis of IgG4-RD (10). The disease is thought to be both an autoimmune and an allergic disorder, with previous studies reporting increased levels of autoantibodies including antinuclear antibody and rheumatoid factor. Peripheral eosinophilia, bronchial asthma, and rhinitis are other common findings in IgG4-RD patients (11). In cases of IgG4-RD involving the lung and thorax, mild and nonspecific respiratory symptoms, such as cough, sputum or dyspnea, occur in about half of the patients. IgG4-RD can involve various structures of the thorax, including lung parenchyma, mediastinal lymph nodes, airway, and pleura, with corresponding variation in the radiological imaging patterns. This wide range of clinical and radiological features has complicated the diagnosis of IgG4-related lung disease (IgG4-RLD) (2, 12). Few reports have described the radiological findings of IgG4-RLD characterized by lung parenchymal involvement. Inoue et al. described four major pulmonary radiological patterns that may aid in the differential diagnosis of IgG4-RLD versus other diseases (12): solid nodular type (mimicking lung cancer), round GGO (mimicking bronchioloar alveolarcarcinoma), alveolar interstitial type (mimicking interstitial lung disease), and bronchovascular type (mimicking sarcoidosis or multicentric Castleman disease). However, the clinical symptoms and pathologic features do not differ among the four subtypes. In their analyses of the radiological and pathologic features of IgG4-RLD, Matsui et al. mostly found mixed subtypes that hindered a straightforward characterization of the disease (13). Most patients with IgG4-RLD have hilar and mediastinal lymphadenopathy as well as thickening of the bronchovascular bundles and interlobular septa corresponding pathologically to a lymphatic infiltration of inflammatory cells. However, in most IgG4-RD patients the disease develops in the lung parenchyma whereas case reports or original articles demonstrating predominant pleural involvement of IgG4-RLD are rare. 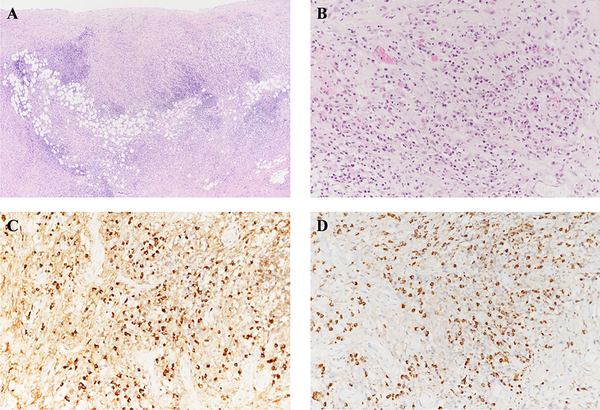 In their pathologic study of 21 cases of IgG4 -RLD, Zen et al. reported five cases in which the pleural lesions were accompanied only by visceral or parietal pleural nodules (9). However, only the histopathologic results of the pleural lesions, and not the imaging findings, were provided such that whether the lesion was visible on CT is not known. To the best of our knowledge, there are only three case reports of IgG4-RLD characterized by pleural effusion (5, 6, 14) (Table 1). In two cases, the pleural involvement was bilateral, including one case in which there was a large bilateral pleural effusion and another in which the pleural effusion was unilateral, with pleural nodules in the contralateral lung. The current case is the first one of IgG4-RLD with pleural effusion, pleural nodules, and bronchovascular bundle thickening seen unilaterally on the CT scan. The differential diagnosis of patients with unilateral pleural effusion and perilymphatic interstitial thickening should include malignant pleural effusion with lymphangitic metastasis, mesothelioma, and epithelioid hemangioendothelioma (15, 16). In our patient, the disease course was subacute rather than acute or rapidly progressive. Cytological evaluation of several pleural samples showed no evidence of malignancy. The pleural fluid analyses demonstrated the presence of an exudate, with negative microbiologic culture results. These features provided a clue to the diagnosis of IgG4-RLD. However, confirmation of a diagnosis of IgG4-RLD is difficult due to the variable organ involvement and imaging findings. In our patient, pathologic confirmation through video-assisted-thoracoscopic biopsy was essential to rule out a primary or secondary malignancy. The histologic hallmark of IgG4-RLD is the infiltration of mononuclear cells and IgG4-positive plasma cells, fibrosis, a ratio of IgG4/IgG-positive cells > 40%, and > 10 IgG4-positive cells per high power field (17). In IgG4-RLD, IgG4 plasma cells abundantly and uniformly infiltrate pulmonary connective tissues, including the bronchovascular bundles, alveolar interstitium, interlobular septa, and pleura. The pleural lesions manifest as a diffuse pleural thickening accompanied by diffuse sclerosing inflammation and a chronic lymphoplasmacytic infiltration with or without fibrosis (9). Given the correlation between the radiological and pathologic findings in IgG4-RLD, the radiology results provide a window into the actual state of the lymphoplasmacytic infiltration along the intrapulmonary lymphatic system. IgG4-RLD lesions mostly develop in the peribronchial or perivascular connective tissues, interlobular septa, and pleura (17). This distribution is essentially a map of the intrapulmonary lymphatic drainage system and may be a significant step in understanding the pathogenesis and imaging features of IgG4-RLD. Steroid therapy is the mainstay of treatment for IgG4-RD (7) and almost always results in a dramatic improvement of the radiological abnormalities and clinical symptoms within 2 weeks to a few months. The dose of corticosteroid can be gradually tapered, but serial monitoring for relapse should be conducted. Moreover, some patients may not show complete remission of either the clinical symptoms or the radiological findings. In those more complicated cases, cyclosporine or rituximab may be effective (2). IgG4-RLD involving the pleura is a rare radiological finding and the clinical relationship is unclear. Many different diseases, both benign and malignant, can be included in the differential diagnosis. Although infrequently seen, IgG4-RLD should not be overlooked, particularly because it is an emerging, treatable disorder. A subacute onset or exudative pleural fluid could be a clue in its diagnosis but pathologic confirmation by surgical biopsy is mandatory. Authors' Contributions: Seonghwan Byun reviewed the literature and prepared the radiological images and the manuscript. Kyung Eun Shin contributed to the basic concept of the report and proofread the manuscript. Jai Soung Park, Heon Lee, Jae Wook Lee supervised and reviewed the manuscript. Susie Chin, and Eun Suk Koh were responsible for technical and material support. All authors have read and approved the final version of the manuscript. Funding/Support: This paper was partially supported by Soonchunhyang University research funds. 1. Deshpande V, Zen Y, Chan JK, Yi EE, Sato Y, Yoshino T, et al. Consensus statement on the pathology of IgG4-related disease. Mod Pathol. 2012;25(9):1181-92. doi: 10.1038/modpathol.2012.72. [PubMed: 22596100]. 2. Ryu JH, Sekiguchi H, Yi ES. Pulmonary manifestations of immunoglobulin G4-related sclerosing disease. Eur Respir J. 2012;39(1):180-6. doi: 10.1183/09031936.00025211. [PubMed: 21719489]. 3. Saeki T, Saito A, Hiura T, Yamazaki H, Emura I, Ueno M, et al. Lymphoplasmacytic infiltration of multiple organs with immunoreactivity for IgG4: IgG4-related systemic disease. Intern Med. 2006;45(3):163-7. doi: 10.2169/internalmedicine.45.1431. [PubMed: 16508232]. 4. Martinez-de-Alegria A, Baleato-Gonzalez S, Garcia-Figueiras R, Bermudez-Naveira A, Abdulkader-Nallib I, Diaz-Peromingo JA, et al. IgG4-related disease from head to toe. Radiographics. 2015;35(7):2007-25. doi: 10.1148/rg.357150066. [PubMed: 26473450]. 5. Choi IH, Jang SH, Lee S, Han J, Kim TS, Chung MP. 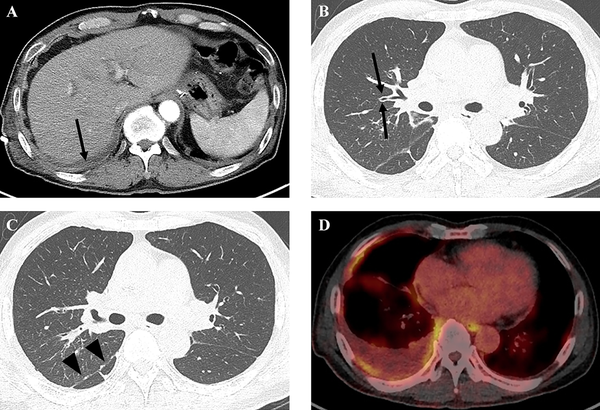 A case report of IgG4-related disease clinically mimicking pleural mesothelioma. Tuberc Respir Dis (Seoul). 2014;76(1):42-5. doi: 10.4046/trd.2014.76.1.42. [PubMed: 24523818]. [PubMed Central: PMC3919965]. 6. Choi JH, Sim JK, Oh JY, Lee EJ, Hur GY, Lee SH, et al. A case of IgG4-related disease presenting as massive pleural effusion and thrombophlebitis. Tuberc Respir Dis (Seoul). 2014;76(4):179-83. doi: 10.4046/trd.2014.76.4.179. [PubMed: 24851132]. [PubMed Central: PMC4021266]. 7. Divatia M, Kim SA, Ro JY. IgG4-related sclerosing disease, an emerging entity: A review of a multi-system disease. Yonsei Med J. 2012;53(1):15-34. doi: 10.3349/ymj.2012.53.1.15. [PubMed: 22187229]. [PubMed Central: PMC3250325]. 8. Chen CF, Chu KA, Tseng YC, Wu CC, Lai RS. IgG4-related lung disease presenting as interstitial lung disease with bronchiolitis: A case report. Medicine (Baltimore). 2017;96(49). e9140. doi: 10.1097/MD.0000000000009140. [PubMed: 29245357]. [PubMed Central: PMC5728972]. 9. Zen Y, Inoue D, Kitao A, Onodera M, Abo H, Miyayama S, et al. IgG4-related lung and pleural disease: A clinicopathologic study of 21 cases. Am J Surg Pathol. 2009;33(12):1886-93. doi: 10.1097/PAS.0b013e3181bd535b. [PubMed: 19898222]. 10. Mahajan VS, Mattoo H, Deshpande V, Pillai SS, Stone JH. IgG4-related disease. Annu Rev Pathol. 2014;9:315-47. doi: 10.1146/annurev-pathol-012513-104708. [PubMed: 24111912]. 11. Masaki Y, Dong L, Kurose N, Kitagawa K, Morikawa Y, Yamamoto M, et al. Proposal for a new clinical entity, IgG4-positive multiorgan lymphoproliferative syndrome: Analysis of 64 cases of IgG4-related disorders. Ann Rheum Dis. 2009;68(8):1310-5. doi: 10.1136/ard.2008.089169. [PubMed: 18701557]. 12. Inoue D, Zen Y, Abo H, Gabata T, Demachi H, Kobayashi T, et al. Immunoglobulin G4-related lung disease: CT findings with pathologic correlations. Radiology. 2009;251(1):260-70. doi: 10.1148/radiol.2511080965. [PubMed: 19221056]. 13. Matsui S, Hebisawa A, Sakai F, Yamamoto H, Terasaki Y, Kurihara Y, et al. Immunoglobulin G4-related lung disease: Clinicoradiological and pathological features. Respirology. 2013;18(3):480-7. doi: 10.1111/resp.12016. [PubMed: 23145930]. 14. Yamashita K, Haga H, Kobashi Y, Miyagawa-Hayashino A, Yoshizawa A, Manabe T. Lung involvement in IgG4-related lymphoplasmacytic vasculitis and interstitial fibrosis: Report of 3 cases and review of the literature. Am J Surg Pathol. 2008;32(11):1620-6. doi: 10.1097/PAS.0b013e318172622f. [PubMed: 18753944]. 15. Kim EY, Kim TS, Han J, Choi JY, Kwon OJ, Kim J. Thoracic epithelioid hemangioendothelioma: Imaging and pathologic features. Acta Radiol. 2011;52(2):161-6. doi: 10.1258/ar.2010.100292. [PubMed: 21498344]. 16. Woo JH, Kim TJ, Lee KS, Kim TS, Kim BT. Epithelioid hemangioendothelioma in the thorax: Clinicopathologic, CT, PET, and prognostic features. Medicine (Baltimore). 2016;95(30). e4348. doi: 10.1097/MD.0000000000004348. [PubMed: 27472721]. [PubMed Central: PMC5265858]. 17. Shigemitsu H, Koss MN. IgG4-related interstitial lung disease: A new and evolving concept. Curr Opin Pulm Med. 2009;15(5):513-6. doi: 10.1097/MCP.0b013e32832ea509. [PubMed: 19550328].